In late October an article I wrote was published in Tablet, a daily online magazine of Jewish news, ideas, and culture. “It’s Difficult To Be A Foodie When You Can Eat Only At Kosher Restaurants” describes my initial dismay about my daughter’s decision to only eat in kosher restaurants. I lament the lack of creative kosher restaurants, particularly in the DC area where we live. There were some harsh responses written on the Tablet website and Facebook page. One that I found particularly dismaying came from a local rabbi: “The author of this article seems to be missing the main point of observing the laws of kashrut – namely, to internalize the concept that food isn’t everything!” I am mystified by this. Is kosher food meant to be mediocre? On the bright side, I also receive recommendations for restaurants offering creative and well-prepared kosher food. These are the comments that I take to heart. 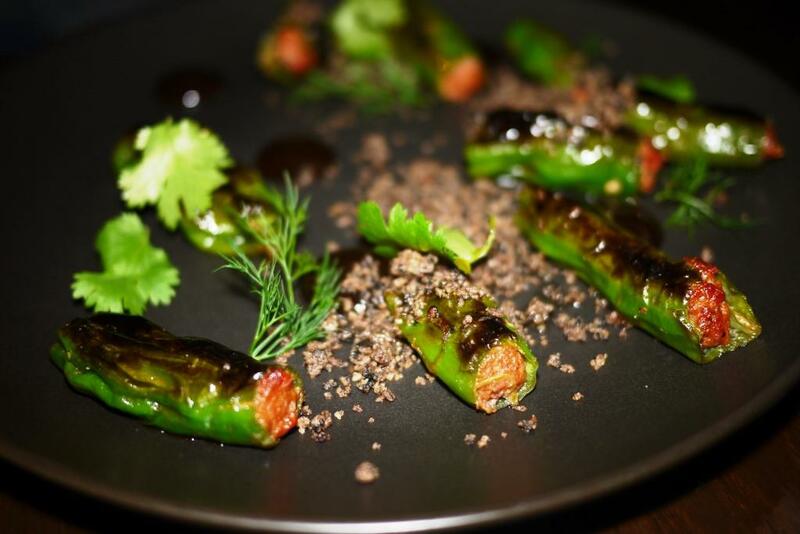 Pardes in Brooklyn is mentioned most frequently as a “foodie” destination. It is also recommended by bloggers Liz Reuven of Kosher Like Me and Dani Klein of Yeah That’s Kosher. I can’t ignore the experts. A mere glance at the menu induces heart palpitations. This is the perfect venue for a trip to New York with my husband and daughter. We are joined at Pardes by a non-kosher keeping cousin who lives nearby. He has never heard of Pardes, but is interested in exploring with us. I like having an unbiased dining companion, as my opinions may be skewed by the joy I feel in sharing a restaurant meal with my daughter. 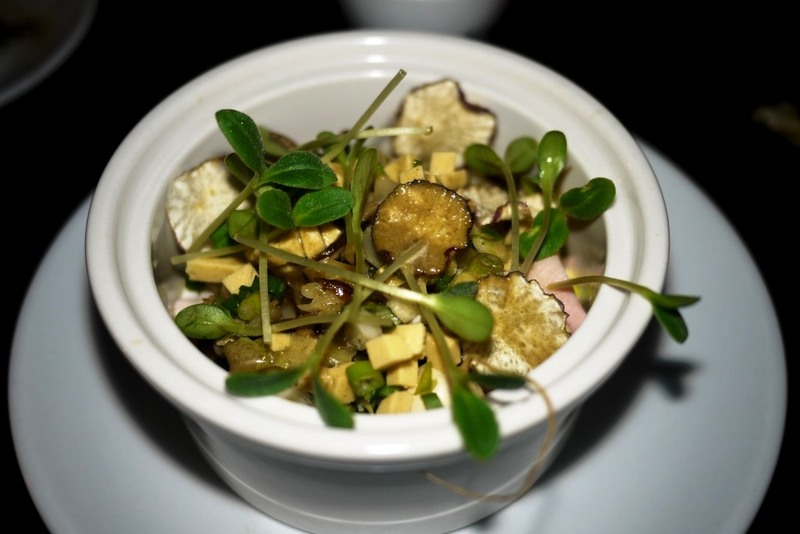 Classical French-trained chef/owner Moses Wendel has fashioned a small plates menu that is unlike any kosher menu I’ve seen, and very much like the inventive menus at the buzziest DC restaurants. I wonder how the Orthodox crowd feels about lamb belly porchetta, BLT’s, and lamb ham. Are they shaking their heads at olive/raisin/walnut dirt or powders of burnt eggplant and kelp? I am relieved to find the restaurant filled to capacity. In general I’ve grown tired of small plates, but in this case I am grateful for the chance to explore a variety of menu options. We intend to order eight dishes for four of us. Two servers separately express concern that we are not ordering enough. We take their advice, doubling up on one dish and adding another. The Pardes menu is divided in sections. Vegetable & Fish, Meat, and Dessert. Since my husband doesn’t eat red meat, we go a bit heavier on vegetables and fish. Kale with peanuts, lime, smoked butterfish, herbs, watermelon radish, and rice krispies has a snap, crackle, pop. 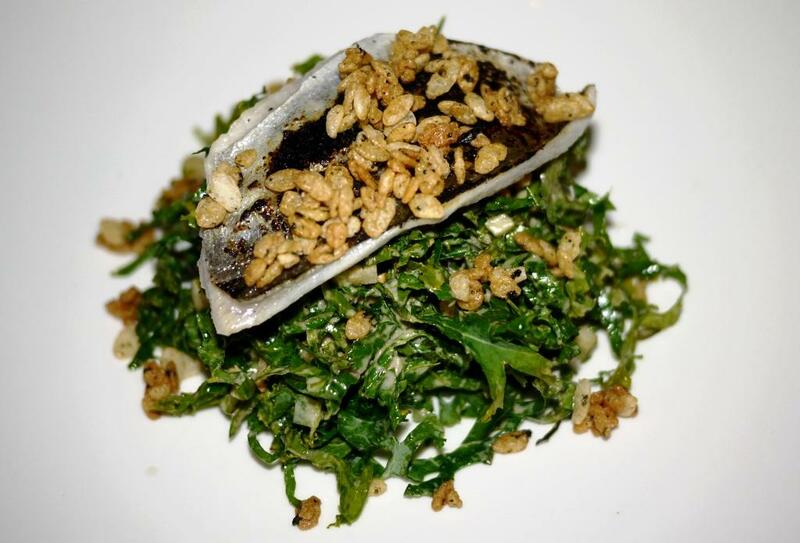 The butterfish is an interesting addition, which makes this more than just another kale dish. 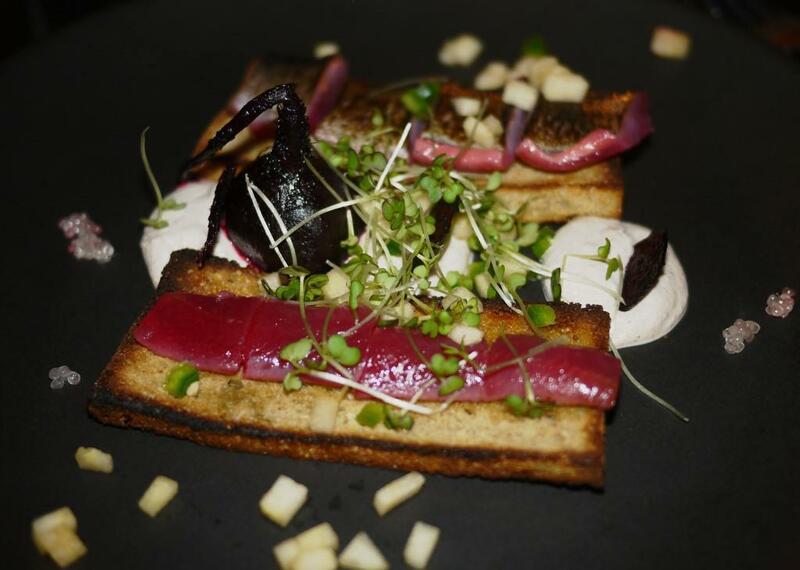 “Red Herring” includes beet juice marinated herring, finger lime, granny smith, beets a few ways, jalapeno, almond puree, and mustard greens. It’s a little difficult to share, as the crunchy toast doesn’t cut easily, but we manage to work it out. Serving this dish pre-cut into slices may not look as pretty, but would be more practical. We have no qualms whatsoever with the flavor. Lentil soup with black olive broth, poached egg, and croutons is mostly for my husband to enjoy while we dig into some meatier dishes. He is kind enough to offer the rest of us a few tastes. I’ve feasted on lentil soup quite a bit lately, and this one tops the charts. 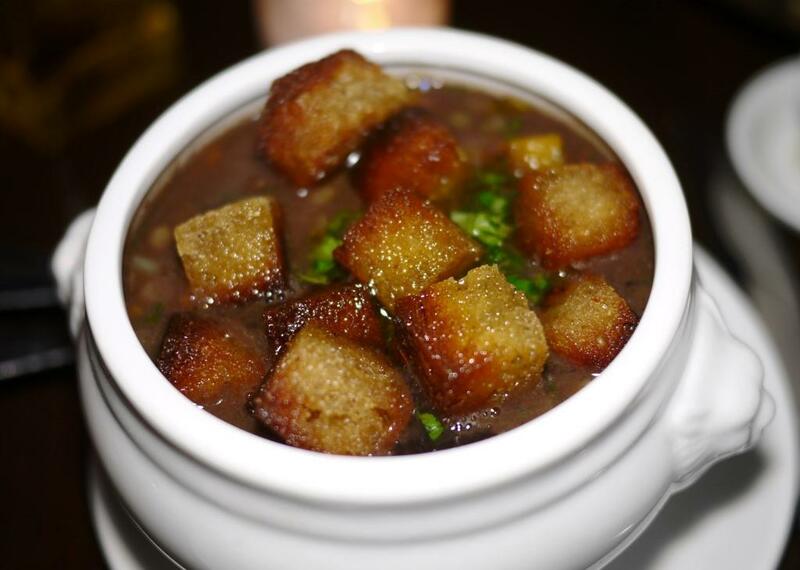 The croutons are surprisingly crunchy, and the intensity of the black olive broth makes us all wish for our own bowl. I don’t make it down to the poached egg in the bottom of the bowl, but this takes the dish to another level, and pleases my husband enormously. One of my favorite dishes of the night is shishito poppers, stuffed with house merquez, raisin/vinegar puree, and olive/raisin/walnut dirt. Serving “dirt” is one of those semi-pretentious moves that turns some people off. But since dirt does not make regular appearances on kosher menus, I am delighted by it. This dish packs a punch, and I applaud the dirt wholeheartedly. I am also quite fond of the pronounced flavor of the raisin/vinegar puree. Finally, from the vegetables and fish side of the menu, are fries with house red wine ketchup and truffle mayo. I could have done without this, as the fries aren’t crispy enough for me and the truffle flavor in the mayo is a little too subtle. A complimentary basket of house-baked breads includes decadent slices of peanut butter and honey bread, and an addictive olive foccacia. We encourage each other to exhibit restraint with the bread, but it’s an effort. Let’s move on to meatier subjects. This side of the menu has so much that piques my interest. In fact, I am flustered at the enormity of the task of narrowing down options. I leave final decisions to my daughter, since this really is her unique opportunity to enjoy innovative restaurant cuisine. I have a tendency to over-indulge her in kosher restaurants. 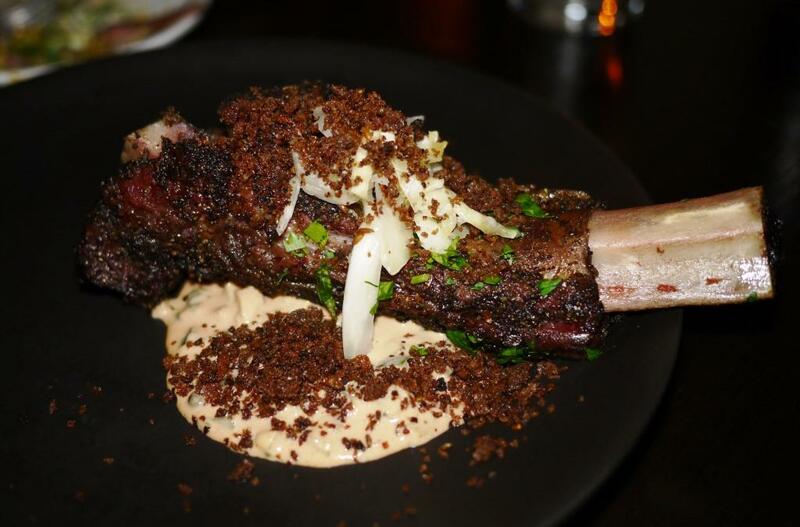 Pastrami rib with Russian dressing, house kraut, and pumpernickel crumb is a big, beautiful hunk of meat. I want to pick up the bone and devour every last shred of meat, but that wouldn’t be appropriate public behavior. In hindsight, I wish I would have been braver. 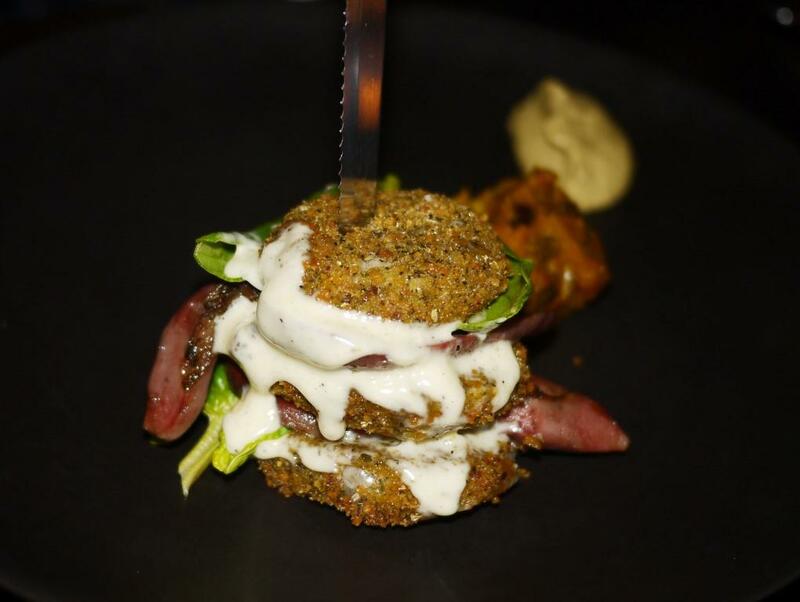 A sandwich of lamb tongue and fried green tomatoes, pumpkin/olive compote, herbs d’Provence mustard, and aioli is squishy and sublime. It’s an awkward process trying to divide this into three pieces, but we are determined to make it work. 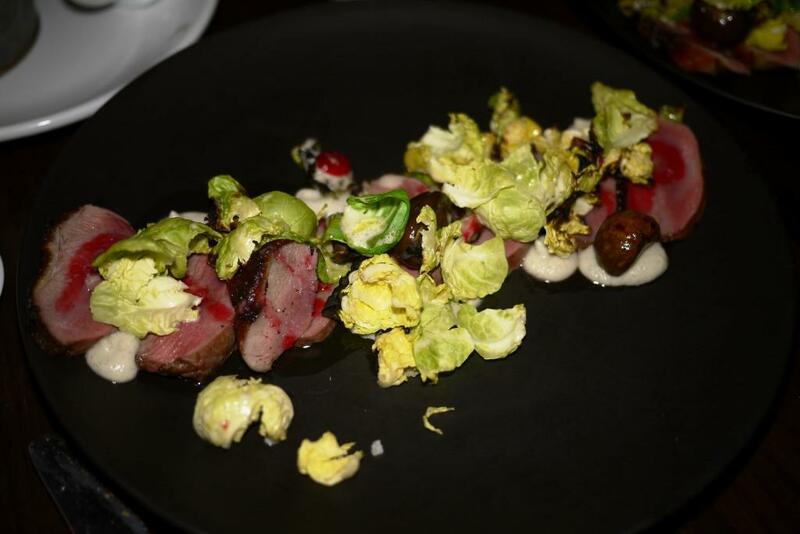 Tender duck breast with brussels sprouts, smoked chestnut, cranberry/cardamom juice, and black radish puree is presented beautifully. Two orders of this dish is more than we need, but we magically manage to make it almost disappear. Chicken with seawood broth, borage, turnip, shitake, cabbage, and mustard gel is earthy with more subtle flavors than the other dishes we’ve enjoyed. I am really too full at this point to partake in more than a bite. My husband finds the dish satisfying, but not mind-blowing. In a meal filled with dishes that overwhelm us with flavor, at this point our expectations are heightened. One dessert stands out as a must have. 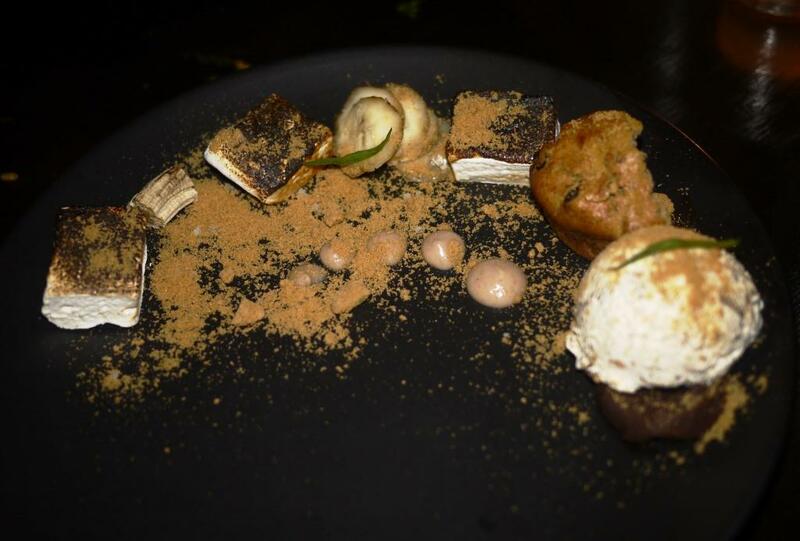 “Smores…sort of” is a decorative plate of banana prepared in various ways, coffee ganache, all spice marshmallow, born sugar frozen, cocoa nib ice cream, date puree, house graham cracker/banana crunch, bread. Parve desserts are often distinguished by the chemical taste of non-dairy substitutes. Not here. I don’t love every element (dried banana is too chewy to eat), but this is a dessert that demonstrates effort, skill, and flair. We are all immensely satisfied with the meal. I’m particularly pleased that our cousin has enjoyed it as much of the rest of us. It’s the “foodie” test I was hoping Pardes would pass. I think back to the rabbi who chided me for missing the point of kashrut. I understand that keeping kosher is about making decisions, and that maintaining observance sometimes requires sacrifices. But I won’t apologize for rejoicing over the very existence of Pardes, where I can enjoy the company of family and partake in elevated, modernist, and kosher cuisine.